In my last entry, I told you that most of my time in Da Nang was spent over coming dehydration and getting used to the extreme heat. Towards the end of my stay in Da Nang I made a better effort to drink water and to stay indoors during the hottest parts of the day. Because of that the heat didn’t affect me as much as before and I started to feel better (as far as hydration was concerned). I did develop a sore throat. It started out as nothing that would stop me from going about my day. 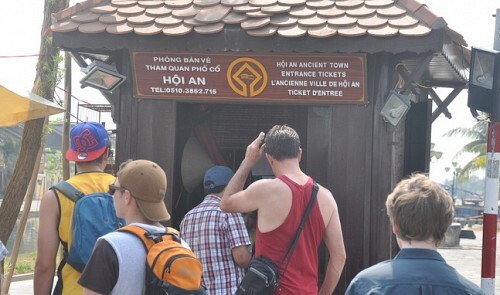 But by the time Mark and I hopped on the bus to get to Hoi An, I had a fever and a throbbing headache. I was in so much pain, that the first 2 days in Hoi An, I was in bed and fast asleep. It was clear that this was no ordinary sore throat. Rest and time would usually get rid of a normal virus-caused sore throat. This sore throat came with no cough, but a migraine headache instead. I needed a doctor. I looked online to find the nearest clinics and hospitals. I was in luck; there were several to choose from. One even promised to cure ailments with teas and incense. Of course, that one was crossed off the list of possible places to seek medical attention. I checked the reviews of the medical centers on google. The highest rated one had a 2.4 rating. The complaints were all the same. The wait was too long. The medical staff was very rude. No one washed their hands. The hospitals were very dirty. And the bill at the end was very expensive. Mark explained, from what he read online, most Vietnamese don’t go to the doctor. Doctor visits take too long and time here is money. They just go to the pharmacy. They talk to the pharmacist and get the drugs they need or want. They completely skip the doctor. “And this is legal?” I asked. I do not recommend skipping a doctor visit. I would never have done this if I weren’t so terrified of seeing one of the GPs whose reviews I spent all morning going through. (One reviewer said his brother walked into a clinic with chest pain and after waiting for hours, died in the waiting room.) I sent Mark out to find a pharmacy and get me some antibiotics. He had looked up the typical treatments of strep throat and found 3 possible types of antibiotics. He easily found a pharmacist and talked to her about my treatment. She laid out 4 types of drugs of various brands telling Mark that anyone of these would do. One was not on his list and two were different brands of amoxicillin. Mark chose the one that said, “Prescription Only”. It took about a day and a half before I started to feel better and several days before I felt well. I stayed in bed for the first 2 days. Even though the hotel had a pool, I stayed out of it until the 3rd day of my taking medication, so as to not get anyone else sick. I did feel strange taking antibiotics without a doctor’s prescription, but I really didn’t want to sit in a dirty waiting room for hours. When Mark chose our hotel, he wasn’t sure if he wanted to be near the beach or downtown. So, he picked a hotel sort of in the middle. Though, it was closer to downtown than the beach. The hotel had a pool, so there was no real need to head to the beach. Since I wasn’t feeling well, we skipped the beach and just went to the pool. When I was really sick, we would eat at our hotel. The food was not that good and expensive. I ordered the pho and got a greasy soup without any vegetables. The broth was horrible. As I got better, we ventured out more. We ate at the restaurants within one or two blocks of our hotel. There was one that was just plain awful. We walked into the restaurant because there were a group of travelers eating there already. We ordered our food and waited. There were many Vietnamese people sitting around watching the Fast and the Furious 3 on the restaurant’s HDTV. Then I noticed something strange. “What do you mean? That guy, over there, is ordering food.” Mark pointed to a man a few tables away from us. When our order arrived everything became clear. The food was terrible. It tasted like something I would have made by putting random left-overs in a pot. It didn’t even taste like bad Vietnamese food. It tasted like a microwaved dinner. All the restaurants near our hotel were like that. And, until I felt well enough to walk downtown, that’s all I could eat. Once I felt better and could walk further distances, the food improved. The best foods came from the little back alley vendors that sold one or two dishes. If the menu looked more like a laminated book, the food would be bad. The smaller the menu the better the food. If there was no menu at all, the food would be fantastic! The old town area, unfortunately, doesn’t have good food. The place is over saturated with tourists. Everyone is working so hard to get tourists into their restaurant and they don’t spend much time on their cooking. The food tastes bland and plain. At one Ancient City restaurant we ordered some “white rose”, a Hoi An specialty and fried spring rolls. The white rose (pictured on the right) tasted like forgettable indifference. Some of the dumplings were burst, which I would have easily overlooked if they tasted good. They had no flavor. The spring rolls too were void of seasoning and all joy. After a few meals in the ancient city, Mark and I knew better than to go there hungry. The drinks on the other hand were great. My only recommendation is to stay away from the durian smoothies (top picture with some durians in the background); those are just god-awful! You can enter by plane, train, boat, or bus. Make sure to get a visa before going to Vietnam. Although some nationals can get a visa at the border for a few days, many cannot or will need a visa for longer stays. Visit the Vietnamese embassy in your country to get a visa. Or you can apply for a visa online if you do not live near an embassy or consulate. Remember if you enter Vietnam on a single entry visa then leave, you must wait 30 days before returning to Vietnam on another visa. Don’t worry if you cannot get Vietnamese dong from your local bank back home. You can get your dong at the bank in Vietnam. (DO NOT get money at the airport. You will never get a good rate. Use an ATM/bank.) Don’t get too much; no one will buy it back from you. Many hotels, fancy restaurants, and tour agents will take US dollars or Euros. Though who knows what exchange rate they will use? You will need dong for taxis, small shops, and local restaurants and vendors. When you get to Hanoi or Ho Chi Minh pick up a map of the area from any hotel, hostel, travel agency, or tourist information center. Once you have one of those you’ll be able to find anything. Having a map of the area in Hanoi is very important. Every block has a different street name so once you know the name of street something is on you can easily find it with a map. Wherever you choose to stay, make sure you bring a picture and the address of the hotel. One common trick that taxi and motorbike-taxi drivers like to pull is to take you to the wrong hotel. When you say, “I asked for ABC Hotel!” They will tell you that the name changed. They usually get a commission for bringing tourist to certain hotels. Sometimes hotels do change names. But most likely a hotel will not change names between the time of your booking accommodations and your arrival without telling you. Also, asking the average Joe on the street for ABC hotel will do nothing. Locals don’t stay in hotels, so they don’t remember hotel names. But Mr. Joe will know where 123 Hanoi St. is. Also for taxis, NEVER agree to a flat rate fee. The flat rate fee will always be way higher than it should be. Always demand that the cab driver use the meter. If he doesn’t want to use his meter, get out. Taxi drivers are a dime a dozen. This is true in most countries. For motorbike taxis, settle on the cost of the ride before getting on. Ask fellow travelers for advice on how much a ride should cost. Watch out for cyclo drivers that claim not to have change as a way to get more money out of you. If you need to, wait for one of those fruit vendors to come along and buy something from her to make change. You really should ask the cost to your destination and make sure you have exact change before you get in the cyclo. It’s best not to say anything bad about Ho Chi Minh while in Vietnam. He is still very much loved by his people. There are companies that charge 10USD to take you from Hanoi to the airport. They are all around Hanoi. Use one of those instead of jumping into a random cab. There are also many stops in between. 20,oood to 50,000d depending on how honest the fare collector is. First bus leaves either stations around 5:00AM. Then they leave every 5 to 20 minutes after that, depending on the time of day. Last bus leaves either stations around 5:30PM. The bus is always yellow with the number “01” on the windshield. You might get the fare collector to be more honest if you take a photo of the fare chart (near the front door on the outside of the bus). Then show it to him while pretending you don’t understand why he’s asking for 50,000d. Keep in mind that 50,000d, while a rip-off technically, is about 2.20USD and way cheaper than the fare for a taxi or taking a tourist/ shuttle bus. Unlike a tourist / shuttle bus you can book through your hotel, the “yellow 01” leaves several times a day. If you miss one, just wait 5-20 minutes for the next one. Ask at the reception of your hotel/ hostel for the nearest bus stop or check with google maps. This is a one time fee and good for 2 weeks. Just keep your ticket and present it when ever an official asks to see your ticket. After 5 or 6PM the area is closed off to cars and scooters. Just keep in mind that some of the buildings are people’s homes. They don’t ask everyone to pay for or show their ticket. But, everyone should pay. The money goes to restoring the area. Buy your ticket at a ticket station. Be careful. Some tourist have stories about fake tickets. Make sure to buy your ticket from a ticket station. In my opinion, the restaurants here are not that great. They are overpriced and the food is mediocre. Look for food stalls outside of Old Town. This place has very delicious food. I recommend eating here before entering the old city. The Da Nang dragon spits water on the people to cool them down. Mark and I left the resort at Hue beach. It took about half an hour to check-out and wait for a taxi to the train station. We sat in the heat willing the air-conditioned taxi to come pick us up as quickly as possible. When the cab came we were disappointed to be seated in a car with the windows rolled down. “Well, hopefully the train station will be air-conditioned,” I thought. We sat in the hotbox that was the waiting area of the Hue train station. There were fans, but there were too few of them and they were all set to low. They did have a placebo effect on some commuters who angled themselves to sit in the fan’s faint breeze. But, when I tested it out, I felt nothing. It did, sort of. The normally hot air was cooled to slightly too warm. Mark and I squeezed into our seats and tried to think cool thoughts. I didn’t drink much of anything to avoid having to use the bathroom on the train. But having a drink, even a room temperature soda, would have helped me to stay cool during the 3 hour train ride. By the time the train pulled into the Da Nang train station I was feeling very unwell. My backpack felt heavier than normal and standing up was too much effort. Mark found a taxi, or rather, a taxi driver found Mark and delivered us to our hotel. Once in our hotel room with the air conditioning on, I took one of the free bottles of water on top the mini fridge. Because I started to feel better after drinking water and sitting in a cool room, Mark and I concluded that I was probably dehydrated. In Vietnam, the most popular type of bottled water is mineral water. Many times, when looking for water at a convenience store, that’s the only type being sold. I hate mineral water. I much prefer spring water since it has no taste. So when I have mineral water, I tend not to drink as much of it as I would spring flavorless water. I think that here, spring water is considered “cheap” and that mineral water is the top-tier water type. Mineral water costs more in the stores. When you get a free bottle of water on buses, in hotel rooms, and on tours, it’s always spring water. My dehydration made me think about being more responsible about my health. If I were sick at home, I’d just stay at home. It’s not a big deal as long as I still have “sick days” left at work. But on vacation, I’m paying to stay in a hotel. I’m paying for food. I’m not getting paid from a job. A sick day is a waste day. So I need to make sure I have as few “sick vacation days” as possible. If the water tastes funny, either drink it anyway or drink something else. DO NOT drink tap water in Vietnam. Drink juice, drink all your soup, eat juicy fruits. Carry a coffee tumbler with water and put the ice from your drinks into it. Now you have cold water. Eat Fruit (bananas) & Vegetables Order dishes with lots of green leafy vegetables in them. Go to a grocer’s and buy fruit. No matter where you go you will always find bananas and they will be the cheapest fruit. Eat them; they’re good for you. If your accommodations come with a free breakfast, chances are you will get an unlimited supply of bananas in the morning. Walking down the street in Vietnam is like walking along an obstacle course. Watch out all the time! Be extra careful when it rains. Many businesses like to use marble tiles in front of their buildings and it gets really slippery! Look both ways before crossing the street. Then continue to look both ways as you cross. Cross with other people when you can. Watch out for drivers going the wrong way on a street. Watch out for scooters driving on the sidewalks. This is one of the best ways to prevent a cold. Bring your own soap with you. Hepatitis A & B; Tetanus; Typhoid. It took me a few days to recover from my dehydration. Until I got used to the heat, I had to make sure I was indoors from 10:30 to 16:00 every day. The heat really zapped my energy and even my thinking slowed down when I stayed out too long during the hotter parts of the day. Our first hotel was chosen because it boasted a 5 minute walk to the beach. We tried it. It was not a 5 minute walk. Well, maybe it used to be, before a huge 5-star resort parked itself between the hotel and the beach. Now, tourists have to pay to enter or walk around. And our hotel really needs to stop advertising itself as close to the beach. You can almost see the beach from here. We started to walk around the resort only to find another resort, and another, and another. There was just resorts after resorts all along the road. Where there wasn’t a resort there was a construction site for a new resort. All in all, the “5-minute” walk to the beach was a 35 minute walk. I couldn’t handle that. Even after drinking lots of water and staying in the shade as much as possible it was too much for me. By the time I got to the beach I would have a throbbing headache and feel over tired and dizzy. Once at the beach, the water didn’t look that great. The sea looked rough for most of the day. In the mornings, when the beach was calmer, it was crowded. Actually, it was crowded, though less so, at other parts of the day too. We changed hotels. We found one across the street from our “5 minutes to the beach” hotel. We weren’t any closer to the beach, but our new hotel had a pool. We stayed in for most of the day, swimming in the pool. In the evenings we would walk along the beach sightseeing and finding cheap places to eat. Da Nang beach has many lovely cheap places to eat. But, none of them are near the beach. You have to walk down back alleys or go away from the beach. The street our hotels were on had many nice, inexpensive places to eat. Sometimes, they charge foreigners 300,000 and sometimes they do not. The park is mostly empty. Sometimes you have to wait for enough people to get a ride started. The food inside is mediocre, but not expensive. Not all the rides are completed. Some rides are under repair. It changes colors for about a hour. The fire breathing and water spitting lasts for about 10 minutes. I recommend taking a taxi here if you don’t know exactly where to go. There are lots of food vendors in the area where everyone watches the bridge. Enjoy the horrible talent show while you wait for things to get started. 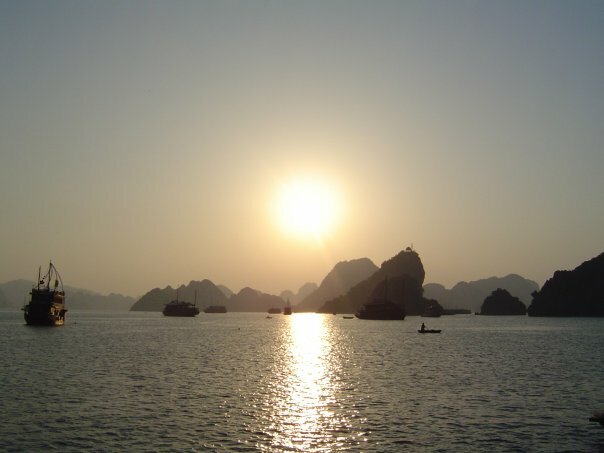 Gone were the Hanoi times of hot days and cool evenings. Hue was blazing hot during the day and manageably hot in the evenings. This was not the weather we wanted to go sightseeing in. Walking around took too much effort at these temperatures. Breathing took too much effort. It was time to relax. Mark and I headed to the beach. We heard many backpackers going on and on about Hue beach. They would rent a scooter and drive out there in the afternoon and come back to Hue in the evening. We wanted more. We would stay at the beach for several days. We found accommodations in a grass hut bungalow. That sounded real-island-like. We packed our stuff, leaving behind more clothes to lighten our bags and headed over. It looked like a dream come true as we walked down the semi-tiled path to the beach and to our hut. We entered the hut. There were six bunk beds, meaning the bungalow could sleep 12 people. Each bed had a fan and a mosquito net. But, only 2 were made up and ready to be slept in. Sometimes the wind just blows the doors open. “Where are the lockers?” Mark asked. The lady showing us around opened a cupboard made of dried grass and bamboo. The door was held close not by a lock, but by friction. She pointed inside. I took a look. I could see that some termites had had quite a feast there recently. “How does it lock?” Mark asked knowing fully well that it could not be locked. The lady shook her head. The lady showed us the door, pointing to an obvious lack of a key hole. “No key,” she said. Then she walked outside to show us the bathroom. We followed her. The bathroom was very rustic. The toilets were okay, I guess. But, the showers could have done with more walls or a bigger door at least. There were three showers each with a set of 2 feet long saloon doors about 3 feet off the ground. No locks. No curtains. It was actually the shower for the beach goers. It was meant to be the place where swimmers rinse the salty ocean water off themselves. These people would be clothed in their swimsuits and didn’t need complete privacy. Mark and I would be using these same semi-open showers as showers. We would not be wearing clothes. But, we didn’t want to admit that the place was a dump. Or at least that we pick the dump option of this resort. Our hut hotel was operated in conjunction with another resort, one that cost 350 euro a night. The pamphlet for our bungalow was made up of mostly photos of that resort. The resort had several indoor pools. Some rooms had their own pool. There was an outdoor pool and a room of marble pillars, for some reason. On the last page in the corner was a picture of our hut. The huts were the “backpacker friendly” accommodations at 8USD per night. So, we weren’t expecting much, just a locker and a private shower… the essentials. It’s way past shower time. After our tour we sat on the beach to discuss things. “What are we going to do?” I asked Mark. “I guess we can put all our stuff in the bamboo cabinet and hope no one looks in there. If all our stuff is put away, maybe people will think the hut is empty and that there is nothing to steal.” Mark tried to sound reassuring. “And I guess we could shower really early in the morning and really late at night…” I added. That used to be Mark’s face. For the first few days things did seem alright. We woke up with the sun and took showers. We got dressed and put all our stuff away. But then we got more comfortable and started hiding everything except our swimsuits and towels; they needed to dry. We tried swimming. The beach was very nice, but the water was too rough to relax in. Even when the water only came up mid-thigh, it would be just a matter of time before a wave would come along and knock you over. I could only be in the water for about 15 minutes before getting tired of being thrown about. Then one night we stayed out on the beach a little too late. We got bitten up by sand fleas. This got us to our breaking point. We were ready to get the hell out of Dodge. While we were at the beach we made friends with other guests. Not the guests from the 350 euro a night resort, but other guests like us. They told us about beaches further south that were better and calmer than this beach in Hue. Mark and I decided then and there that we would beach hop our way to Ho Chi Minh City. Checking reviews on google, booking.com, and hostelworld.com. This time, we would choose our hotels more carefully. This time we would read online reviews and make sure our next stay will be more pleasant. I know how complaining about our stay at a beach may come off. Three weeks earlier we had jobs, responsibility, and winter coats. No matter how you looked at it, this was an improvement. …sand fleas and all. Let’s stop and talk about locally crafted beer. Do you look for fresh, high quality malt and hops? Does the brand or batch size matter to you? Or do you, as a connoisseur of the bubble brew, look for a different aspect to determine your enjoyment? If you are anything like me, then you’ll be pleased to know that in Vietnam you can get a special kind of beer that pleases the pallet at an extraordinary price. “Bai hoi” also known as “fresh beer” can be found littered all over Vietnam, but predominantly in the northern regions. I was first introduced to this delectable treasure in Hanoi. So by now, you must be wondering what magic makes this beer stand out from the rest. Well, it’s outstanding price. It’s usually priced around 5,000 dong. For those who need a price conversion, it come to 22 cents per glass. In other words, you can drink a small kegs worth for what you usually carry in your wallet. In fact, the first hostel I stayed in gave it away for free during happy hour. Okay… Maybe more like happy half hour. Now, beer this cheap comes with a catch. That would be favor. In a fair contest, PBR would retain its ribbon and Budweiser would still be king. But if your watch is often set to Miller Time, then you’ll have no problem pushing down this kind of libation. Also the alcoholic nature of the drink is less than its kin. It hovers around the 3% mark. To those who come to South East Asia, you’ll quickly learn that beer can be inexpensive and tasty. I suggest giving “fresh beer” as taste, but also give other locally brewed beer a chance. Many like “Bai Saigon” and “Huda” have much more to offer in overall satisfaction. The price may be an exponentially higher at four or five times the cost; but as with all things in life, you get what you pay for. Food goes down better with local beer. Do you remember this legendary scene from Happy Gilmore? This begs the question; why not have poop for breakfast? Well, maybe not that exactly. You see, I had the synthetic version. Ever since I watched the movie “The Bucket List”, Kopi luwak was something that was on my radar. Kopi luwak is one of the most expensive coffees in the world, selling for about US$3,000 per kilogram (2.2 lbs). The specialty Vietnamese coffee beans are made with the help of wild civets also called “weasels” here. Now, don’t imagine these weasels wearing barista aprons. Instead, they help with the bean selection. They supposedly only select the ripest and, as a result, the best coffee berries. Then the weasels eat them. After some time and nature doing natures work, the berries arrive on the other end of the weasel. In what I assume to be “the new-guy-at-he-coffee-farm’s job”, a person goes around collecting the digested oblong berry logs laying on the ground. The weasel excrement gets washed and then the beans goes through the same process as the rest of the coffee that gets served to us. Now, I want to make clear that I did not drink Kopi luwak. For one thing, I hear rumors of some weasels being mistreated. Some farmers looking to profit, cage and force the beasts to only consume coffee berries to maximize yield. For another, most poop coffees are fake. They are just regular coffee bean passed off as the genuine article. And lastly, I’m not insane enough to pay more than Starbucks’s prices for coffee and I rarely allow myself to do that. That’s $20 per cup for possibly fake weasel coffee! However, I learned that there are legitimate fake poo coffee at a reasonable price. Now, that’s the kind of thing I go for. You see, the weasel poo coffee get’s its fame for two things. The selection of the best coffee beans and the digestive enzymes in the civet’s stomach which rounds out the flavor and adds to it somehow. Some Vietnamese companies learned how duplicated this process chemically. Now all I had to do was to buy some. However, I encountered some difficulty in getting my synthetic poo coffee. In Hanoi, they are trying to sell you the “real thing”. However, the “real thing” isn’t real at all. It’s either synthetic poo coffee or just regular coffee. But this doesn’t stop them for trying to sell it for “real thing” prices. There are also lots of companies selling coffee with a picture of a weasel on them. Technically, they don’t say its real poo coffee or synthetic poo coffee, it’s just coffee with a picture of an animal and if you get the wrong impression, well… It gets really confusing very quickly. Look, I’m just your average tourist looking to sit down somewhere and have a nicely brewed cup of coffee that mimics the beans that been digested by weasels. That’s not too much to ask, is it? Well, after studying up on it online, I learned that Vietnam was the second largest supplier of coffee in the world. And I also learned that Vietnam also has a problem with some places selling fake coffee beans. Yes, you read that right. Fake coffee beans. Apparently, you can dye soy beans and bake them a certain way to resemble and taste like coffee. And it actually fools people. What I can’t understand is why there isn’t coffee flavored tofu on the shelves of my local supermarket? I would eat that. So after some time, I found a few brands that sell the actual synthetic poo coffee with real coffee beans. Imagine that!? When I discovered this, I was off going in and out of stores asking where they kept their best “weasel dropping beans”. I eventually found a box that met my qualifications, I bought it and brought back to my hotel to try. Both my wife and I were excited to give it a try. However, a coffee pot wouldn’t work for this. Mostly because we didn’t have a coffee pot in our hotel room. Instead, we did like the locals and used a device that slowly drips the brew directly into our coffee cups. We precisely measured the amount of coffee grinds needed with our eyes. Slowly poured in the hot water over the coffee grounds and waited. Using my expertise, I wanted to know if I could detect all the subtle differences between regular Vietnamese coffee and this special kind. When the coffee making device finished I looked inside my cup to discover that my wife, in tradition to how most Vietnamese make their coffee, filled it half way with condensed milk. So did my sophisticated pallet discern the hints of weasel dung over the condensed milk? Well, no. The major flavor in the forefront was the delightful sweetness that is condensed milk. Then it’s followed up by the espresso like taste of the coffee. The subtle earthy hints and chocolate flavors or the less bitter taste didn’t really come through. On my second go, I had my weasel manure flavored coffee straight. And this time, I tasted… coffee. Yep, a good cup of coffee. A bit anti-climatic I know, but there is one good take away I get from this. The next time I make a pot of coffee and someone tells me it taste like crap, I’ll just take it as a complement knowing how much crap coffee can cost. This was the day it suddenly got hot. In Hanoi it was warm. But in Hue, it was hot. I brought a coffee tumbler with me on the trip. This was the day I started using it religiously. It is a Starbucks Lucy Tumbler. It keeps hot things hot and cold things cold for hours. This tumber is saving my life right now. We would buy some cold drinks, preferably one with lots of ice. When all the drink was gone and I had nothing but ice left, I would put that ice in my tumbler with water. Then I would have cold water all day. The Forbidden Purple City is so beautiful. I wanted to take way more photos than I did. It was just so hot. I would walk around for 15 minutes then have to look for a place in the shade to sit and sip my cold water. If the place wasn’t so spectacular, I would have given up and spent the day in an air conditioned coffee shop. Even if you don’t have a coffee tumbler. Mark bought his on the walk from the hostel to the ancient town. Go early in the morning (8:00 – 10:00) and then in the evening (after 15:30). Stay indoors during the hottest part of the day. Wear a hat and sun screen. There are sections of the palace that have fans and an air condition unit. Hang out there for a while. Unfortunately, the doors of the air conditioned areas are never closed. So, it’s cool only right in front of the ac units. The Forbidden Purple City in the restored part of the ancient town. This place is very beautiful. Mark bought our train tickets from the travel agent at our hostel. He was a little dissatisfied with this process. He kept having to explain what he wanted. He also had a hard time understanding what the agent said too. With the length of time it took to get the ticket, he felt the commission rate the agent took was too high. In the end, Mark felt confused and he just hoped everything worked out all right. It did. But not wanting to go through that again, Mark turned to the internet the next time we took the train. Buying the tickets online, doing it yourself, and doing it in English leaves little up to chance. Later we met a man and his cousin who wanted a compartment to themselves. They went to a travel agent. She told them to get a compartment for just the two of them, they would have to book all four beds in a soft sleeper berth. “Fine,” they said. “Give us the best bunks you have.” One was sold 2 upper bunks and the other sold 2 lower bunks. When they boarded the train they found that the two sets of bunks were in two different compartments. One compartment had a screaming brat of a child. The other had Mark and me. It took a while for Mark and me to find our berths. There was a big drunk guy fumbling with his ticket pulling a rather large non-spinner suitcase behind him and blocking the way. “I don’t have my glasses,” he kept repeating. “I don’t have my glasses.” If I wanted to hurry things along, I had to help him find his bunk. I took his ticket and looked at it. “Oh, you’ve past it,” I told him. He spun around, but with his suitcase in front of him, he was too drunk to move it. Both he and his luggage were too large for him to just pick the suitcase up and place it behind him. He kept spinning around hoping that one more try at turning would somehow get to suitcase on the other side. It took no time at all for a line of people to form in the corridor. I had to get this fat man out of the way quickly. He was just so drunk and clumsy. “Hey!” I tried to get his attention, but he kept turning. “Push it instead of pulling.” He didn’t seem to hear me. “Or you could walk backwards.” I got no reaction out of him. “Probably to uncoordinated for either of those anyway,” I thought to myself. Then I suggested that he step into any compartment, pull his luggage further down the way, then step out again. That would have easily solved the problem. But by then he was squeezing around his luggage. He wedged himself between the wall and his suitcase. There were groans and inelegant Chris Farley-like twitching. I looked past the drunk and saw some train officials headed his way. The man was still telling everyone about his lack of glasses as he struggled to get free. Just as the officials got to him he popped out on the other side of the suitcase as it fell over. I got everyone to back up a bit and showed him to his bunk. The train officials carried his enormous suitcase for him and placed it next to his bed. Thankfully, he was on a bottom bunk. Later I heard him, a man of about 60, flirting with some teen-aged school girls. It made my skin crawl. When we got to our bunks there was a man in his bed already. He had a little radio blasting old timey Vietnamese music. Mark and I got into our bunks and waited for everyone else to get on the train. We both had top bunks. The fourth person in our compartment entered, pulled out a vodka bottle, and tried to talk to everyone. Only radio man could speak Vietnamese. Vodka guy asked Mark and I, “Where from?” But that was the limit to his English. We told him, but he did not understand our reply. Giving up on conversation, he tried offering everyone vodka. Mark, radio man, and I declined. Not wanting to drink alone he left the bottle on the table unopened. Vodka guy offered many more times, after dinner, right before everyone went to sleep, as soon as he woke up the next morning, after breakfast, and a few more extra times. There were never any takers, so the bottle sat on the table the whole ride, unused. Since talking was out (I guess radio man was not that interesting) and drinking was unsuccessful vodka guy took out his smartphone and played American pop music. This was probably a gesture on Mark’s and my behalf. But, mind you, radio man was still playing his radio. I began to wonder how I would deal with this. Listening to one persons bad music was one thing, but two! Then the train itself started to play very loud awful music too. It was deafening. Both Mark and vodka guy scrambled around looking for a volume button to turn down. Once they found it, the train music was turned off. After that the duel of crappy music didn’t seem that bad. At least it wasn’t horrendously loud. About an hour before I wanted to sleep, radio man’s radio had long since been turned off and vodka guy’s phone’s battery was dying. I prayed that he left his charger at home. Right by his head was an electrical outlet. I knew that the outlet worked. Both Mark and I had been charging our electrical devices. Vodka guy took out his charger and my heart sank. He plugged it in. He waited a while then unplugged it. Then plugged it in again. His outlet didn’t work! He had to turn his phone off to save power. I was never so glad for a dying battery. Usually cheaper and faster than buses. Generally more comfortable than buses. You can buy food on the train. There are meal, snack, and drink carts that come by. If you are in the first car, the food cart might run out of food before it gets to you. If this happens just go to the dining car at the opposite end of the train. There is usually a dining car at the caboose. At longer stops, vendors from that station will jump on the train and quickly sell drinks, food, and snacks. There is always a bathroom you can use. If the nearest bathroom is extremely filthy, try the other end of your car or another car. All train bathrooms are dirty, but not all are filthy. There is usually toilet paper, but it might not get restocked often enough. Bring your own to be safe. Bring your own hand soap or hand sanitizer. Unlike in other countries, the toilet is never locked when the train stops at a station. This is the best time to go! Very low chance of being in a traffic accident. You have to go to the train station which is usually a cab ride away from your hotel. Many tour/ long distance buses pick travelers up in the downtown area just a few minutes walk from most hotels and hostels. Doesn’t run as often as buses in some areas. Doesn’t stop at every city. Some towns are between two train stations. Trains only run north or south. If you need to travel east or west, you have to take a bus. Bring your own toilet paper, hand soap, and hand sanitizer. Even though they sell lots of snacks on the train, you might not like any of them. There are hot water dispensers on every car, but they look really, really gross. Book your tickets online (https://www.baolau.com/) or from your hotel. Don’t buy tickets from someone who doesn’t speak English very well. You might not get what you asked for. You pay a smaller commission when buying tickets online than buying at your hotel or hostel. If you buy your tickets at the train station you pay no commission, but that might be quite a hassle. If you try to buy your tickets on the same day you plan to travel, you run a huge risk of either getting no seat or getting a really bad seat. You don’t have to buy your tickets too far in advanced, unless the day is on or near a holiday. Buying tickets a few days ahead of time will do. Get a soft sleeper for long rides or a soft seat for short ones. The soft sleeper is softer than the hard sleeper, obviously. The soft sleeper has 4 beds per cabin; the hard sleeper has 6. You can sit up in a soft sleeper, but not in a hard sleeper. I’ve never tried a hard seat, but it just looks like torture to sit on for more than a few minutes. Essentially, it’s just a wooden park bench on a train. Since the toilets aren’t locked when the train is pulled into a station, that’s the best time to use it since it’s not moving. The trains are dingy, but so are the buses. The bathrooms are dirty, but so are the ones on the buses and at rest stops. The dining cars are also dingy, but so are a lot of restaurants in Vietnam. 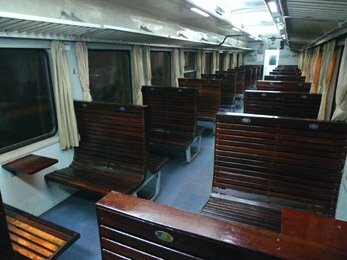 Unless you are leaving from Hanoi or Saigon, your train will depart behind schedule. When heading south, the further away from Hanoi you are, the more off schedule your train will be. When heading north, the further away from Saigon you are, the more off schedule your train will be. There are more bus destinations than train destinations. Sometimes, they pick you up right from your hotel. The stops are right in the down town area. There are many buses to choose from throughout the day. There are tons of bus companies. You meet a lot of backpackers. The bathrooms at the rest stops are better than the ones on the train. But, only in that the train moves making it harder to aim. Bring toilet paper and hand soap/ hand sanitizer. You are usually given a bottle of water for free. It’s good enough to check your e-mail, but that’s about it (if it works at all). They are more expensive than trains and have longer travel times. There is no sleeping on a sleeper bus. They are uncomfortable. There is never enough room. They are usually either too hot or too cold. Every time you drift off to sleep, the driver will honk loudly at no one in particular on the road. If you are in the bottom bunk, the person above you will constantly drop things on you and never ever apologize. If you are on the top bunk, things will always slip out of your hands when the driver swerves. It’s not your fault; never apologize! Half the time horrible loud music will be blasted from cheap speakers. On board, there is usually no bathroom or the bathroom is broken. Companies try to pack as many people aboard as possible. This is not too bad on buses. On vans, this means that someone (or a few someones) has to sit in a jump seat. There is a higher risk of traffic accidents with the bus than with the train. Don’t take a bus if you have a weak bladder. Don’t drink too much water. Bathroom breaks are too few and far between. Keep a jacket and a fan with you. Sometimes it will be too cold; sometimes too hot. But, again, don’t drink too much water! Some seats are better than others. On the sleeper buses, there are seats that are a lot shorter than the rest. You might prefer a bottom bunk or a top. Ask about the seats when you buy your tickets. Take the train, if you can! I have met people who genuinely enjoyed taking the sleeper bus. I’m just not one of them. Do research. There are some sleeper bus companies that have high road accident rates. As for non-sleeper buses, if it’s a short trip (3 hours or less) it’s okay. Still do your research of the bus company’s safety record. Check online reviews for the company before buying tickets. And of course there is always flying. Air fare is sometimes cheaper than train tickets, but getting to and from the airport can be a big hassle. I would fly if I were pressed for time. Since I haven’t flown domestically in Vietnam, I can’t do a pros and cons list. Take a shuttle bus to and from the airport. Try not to take a taxi.